The following post is excerpted from my new eBook, Small Group Leader Toolbox. See more information about this resource at the end of this post. Just as a plant needs a number of specific elements in its environment in order to grow, Christians need at least 7 vital factors or influences to grow spiritually. Each of these plays a significant part in helping people mature in your small group. Be sure you know your place as a leader with these factors (for instance, you are not the agent of life change!). “God the Father chose you long ago, and the Spirit has made you holy. As a result, you have obeyed Jesus Christ and are cleansed by his blood” (1 Peter 1:2). “But when the Holy Spirit controls our lives, he will produce this kind of fruit in us: love, joy, peace, patience, kindness, goodness, faithfulness, gentleness, and self-control” (Galatians 5:22, 23). “Be shepherds of God’s flock that is under your care …” (1 Peter 5:2). “But encourage one another daily, as long as it is called Today, so that none of you may be hardened by sin’s deceitfulness” (Hebrews 3:13). “Do not conform any longer to the pattern of this world, but be transformed by the renewing of your mind. Then you will be able to test and approve what God’s will is—his good, pleasing and perfect will” (Romans 12:2). “He who began a good work in you will carry it on to completion until the day of Christ Jesus” (Philippians 1:6). “For God is working in you, giving you the desire to obey him and the power to do what pleases him” (Philippians 2:13). “All Scripture is God-breathed and is useful for teaching, rebuking, correcting and training in righteousness, so that the man of God may be thoroughly equipped for every good work” (2 Timothy 3:16, 17). “Not that I have already obtained all this, or have already been made perfect, but I press on to take hold of that for which Christ Jesus took hold of me. Brothers, I do not consider myself yet to have taken hold of it. But one thing I do: Forgetting what is behind and straining toward what is ahead, I press on toward the goal to win the prize for which God has called me heavenward in Christ Jesus” (Philippians 3:12-14). Question: How have you seen these factors at work in how people are growing spiritually in your group? Please scroll down and click to comment. 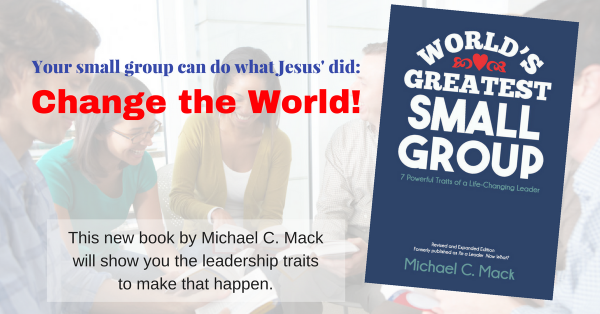 I wrote Small Group Leader Toolbox to provide small group leaders with the resources they need to help them and their groups be effective, grow spiritually, and live out God’s mission for them. This 54-page eBook provides scores of ideas, tips, checklists, how-to’s, assessments, planning templates, and, well … pretty much everything a leader needs to lead a dynamic small group or class. Get your copy of this eBook now!